Shortly after distributing this post last week I was contacted by two different archaeologists both of whom pointed out things in this post that required correcting, which I am happy to do. After all, the point of this blog is to distribute information about this province’s past and I want that to be as accurate as possible. The corrections will be included in the post as red text. Dr. William Fitzhugh (1972) first defined the Groswater Palaeoeskimo based on the excavation of seven sites in the Groswater Bay area of Labrador. It seems they were a highly mobile group that preferred to live along the coast. Based on site location they had a settlement subsistence pattern that exploited inner bay/inner island areas. While they focused on marine resources, terrestrial resources were also important. Their sites suggest that they were occupied by small groups. The sites that Dr. Fitzhugh used to define the Groswater were found on the outer islands in Groswater Bay and they produced very small assemblages, maybe a dozen or so stone tools. Many of the tools were well used and broken, and no structures were found. The sites were interpreted as summer marine mammal hunting stations by small highly mobile groups. This resulted in a somewhat narrow understanding of Groswater culture. However, our understanding became much clearer with the discovery of the large Postville Pentecostal Groswater site in 1977 discussed in further detail below. 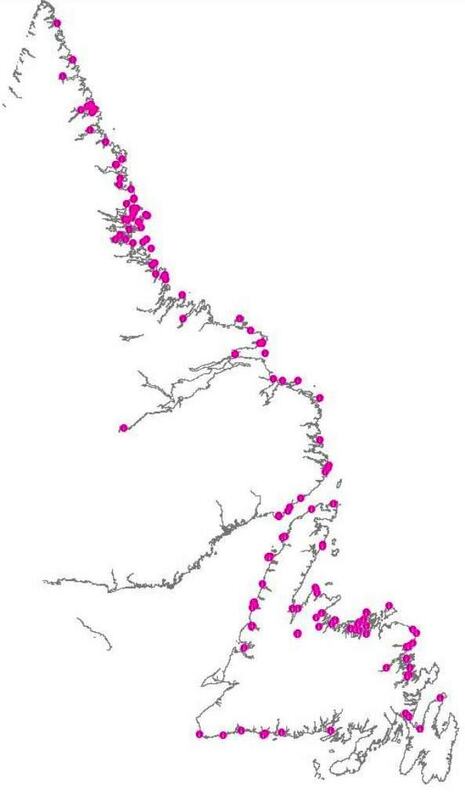 Currently there are 84 Groswater Palaeoeskimo sites recognized in Labrador. Interestingly there are more Groswater sites on the island, 97. The Groswater are the only precontact culture for which this is true. It is not clear if this is a function of Labrador needing more survey work or if it is actually a cultural preference. Did they prefer the Island weather or the available food or was it something else entirely? Groswater Palaeoeskimo sites in the province. The Groswater culture first shows up in the archaeological record just over 3000 BP at sites in Labrador. It is last recognized in the archaeological record on the Northern Peninsula of Newfoundland around 1800 BP. Renouf 2003 summarizes Palaeoeskimo dwelling structures in Newfoundland and Labrador. In Labrador, Groswater habitation structures tend to be small oval surface structures, with mid-passage axial features, box hearths and slab pavements. But, in Newfoundland, there are no clearly defined axial features, only a single example of a box hearth (perhaps not, see below) and no slab pavements. The shape of these dwellings is variable, including oval, rectangular and bilobate. 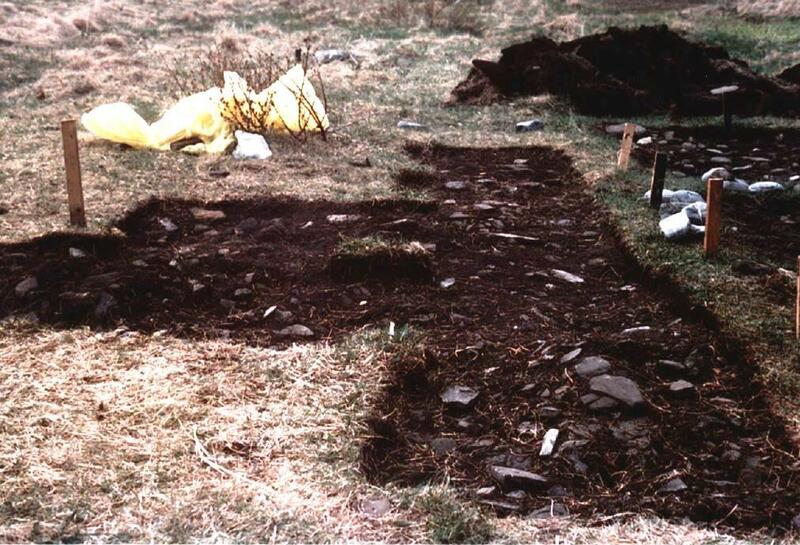 Most Newfoundland Groswater structures are defined in several ways including perimeter rocks, a discard perimeter, a ring of postholes or a perimeter of humus and sand. There also tends to be interior and exterior pit features associated with the dwellings (Renouf 2003: 386-387). As stated above, there is only one box hearth on the island that is clearly associated with a Groswater occupation based on associated artifacts. It was found at Cow Cove on the Baie Verte Peninsula by Dr. John Erwin. The hearth was comprised of four partially upright slabs enclosing fire cracked rock (Erwin 2003). However, box hearths may have been found at L’Anse aux Meadows. Along with the Norse occupation, the L’Anse aux Meadows site contained numerous precontact aboriginal occupations including Maritime Archaic, Palaeoeskimo and Recent Amerindian. Unfortunately, according to Wallace 1989, the occupations are disturbed. 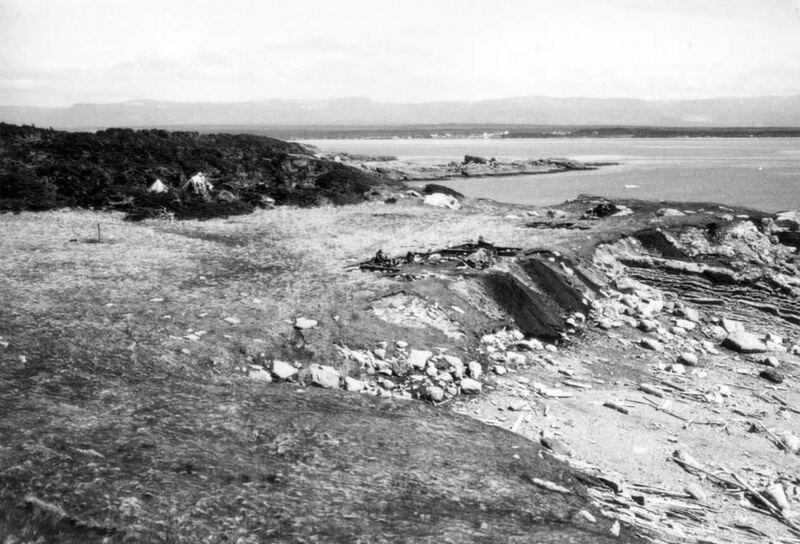 ‘An infinite number of disturbed tent floors, tent rings and fireplaces were excavated on the south shore of the bay by Bengt Schonback for Parks Canada in 1974 and 1975. The features are hopelessly intermingled, one disturbed by the other.‘ Over the years several box hearths were found at L’Anse aux Meadows, none of them are clearly associated with a Groswater occupation, in fact one has a date of AD 670+/-100 (Qu-363) which suggests it is Middle Dorset. However, box hearths are rare on Middle Dorset sites. So, given the amount of disturbance at L’Anse aux Meadows it is not entirely impossible these features are Groswater, but we may never know for sure. Several Groswater sites contain architectural remains (Reader 1997; Auger 1984; Loring & Cox 1986). Perhaps the best known architectural remains at a Labrador Groswater site come from the Postville Pentecostal site. In 1976 Groswater lithics were discovered near and under the local Pentecostal church by a Smithsonian field crew. The rain drip-line off the roof of the church had excavated a shallow trench that was literally paved with Groswater lithic debitage and artifacts. When the Smithsonian crew looked under the church they could see that it had been built on pilings which had minimally damaged the site. They learned that this church was to be removed and a new one built in the same location in 1977. So, they made arrangements to fly-in to the village in 1977 and excavate the site before construction of the new church. The project was a joint Newfoundland Museum and Smithsonian Institution project co-directed by Brenda Clark and Dr. Stephen Loring (with Philip Hiscock and Eric Loring as part of the team). Based on the material recovered along the coast by Dr. Fitzhugh, the crew expected to find a tent ring and a few dozen artifacts but were astonished by the richness and density of the site once it was opened up. They excavated or partially excavated several mid-passage type dwellings with hearths from a total of ten identified structures. They recovered nearly 2000 lithic artifacts including 25 box-based points, 43 side-blades, 61 notched bifaces, nearly 800 chert microblades and more than 100 quartz crystal microblades. A majority (56%) of the artifacts were made of a mottled reddish-brown, green, grey and tan Ordovician chert which likely comes from the island of Newfoundland. So the site was huge with an extensive lithic collection (Loring & Cox 1986). Perhaps the most important thing about the Postville site is the story the lithics tell. Groswater sites, all the way up at the northern tip of Labrador at Nunaingok, contain distinctive box-based points made of Newfoundland chert, while the Groswater assemblages on the Island have some Ramah (from northern Labrador). This is evidence of the existence of an impressive exchange of raw materials and information throughout the Palaeoeskimo world and an impressive degree of mobility! Loring and Cox made the argument that maritime adapted people, living essentially in a linear, i.e. coastal, environment, need to construct social mechanisms that enable them to have access to distant resources and neighbours should the local resources become compromised (Loring & Cox 1986). Moving the church at the Postville Pentecostal site in 1977 (Philip Hiscock). Postville Pentecostal site (Philip Hiscock). Perhaps the best known architectural remains at a Newfoundland Groswater site come from the Factory Cove site, near Cow Head. The Factory Cove site was found by James Tuck in 1976 and it was excavated by Reginald Auger in 1981. Auger uncovered several features including a tent ring with an outline of stone measuring 4×4 metres; a bilobate dwelling that contained a mid-passage hearth; and a lean-to dwelling. Excavation of Factory Cove in 1981 (Auger 1984). The Groswater lithic industry includes the typical plano-convex, box-based endblades used in harpoons, unnotched endblades, a variety of bifaces, chipped and ground burin-like tools, ovate and circular sideblades, corner spurred unifacial endscrapers and microblades. The Groswater people typically used several different types of lithic raw material, the most common being Cow Head chert, however, soapstone, quartzite, nephrite and slate have also been found in Groswater sites. The Groswater tool kit is based on flake reduction. The first step to make a Groswater tool is to detach a large flake from a core. Regardless of the shape of the flake it was thinned until it was suitable for further modification. Only then did the flaking for the final shape take place. In the case of bifacially flaked knives, the end product was dictated by the shape of the thinned blank. Groswater endblades. Note the unnotched endblades l, m & n (Anton). Groswater knives. Note the variety of blade shapes (Anton). Groswater harpoon reproduction. The side blades would have been slipped into a slot of the side of the harpoon just below the end of the stone endblade (Rast). Side blades that would have been slotted into the side of a harpoon. Side blades that would have been slotted into the side of a harpoon (Reader). The first excavation I was part of was near Cox’s Cove on the west coast of the island with David Reader. We estimated that the site had eight Groswater houses, two possible Dorset houses, and a very late Little Passage-Beothuk house as well as several middens with excellent faunal preservation. In 1997 we excavated an oval Groswater house measuring approximately 5×5 metres. The house was surrounded by a mound of discarded fire cracked rock, lithic material and faunal remains. Excavation of the outer perimeter wall of a Groswater house near Cox’s Cove (Reader). This excavation had such an impact on me that I wrote my Honours Thesis on Groswater unnotched endblades. The Groswater made distinctive side notched endblades for hafting, so much so that they are often referred to as ‘box-based’ endblades. Examples a & b in the photo of Groswater endblades above are good examples. However, triangular or unnotched endblades often are part of a collection from Groswater sites. Examples l, m & n in the photo of Groswater endblades above are good examples. For my Honours Thesis I searched 75 unnotched endblades from the Factory Cove and Postville sites for use-wear using a microscope. I was curious to know if these artifacts were tools or just a stage to becoming ‘box-based’ endblades. The use-wear I found suggested unnotched endblades were used as cutting and or scraping tools; they were much more than just one of the steps to a finished product. I have always personally found that this was an interesting culture to study and there is still so much to learn. For example, Anton looked at the relationship between the Groswater and the preceding Early Dorset and concluded that while contemporaneous, both groups tried to avoid each other through a division of land use. However, a recent genetic study suggested that the people of these archaeologically recognized Palaeoeskimo cultures were related. So why the avoidance? Why the different tool kits? Was it just a cultural difference, i.e. they were basically the same people but they just preferred to live differently? How much of a role did environment play in these differences? Is Groswater just a regional variant of Early Dorset and the later Dorset? So many questions yet to be answered. 2004 St. John’s Harbour 5 HeCi-30 and an Examination of Groswater and Early Dorset Relationships in Labrador. MA, MUN. 1984 Factory Cove: Recognition and Definition of the Early Palaeo-Eskimo Period in Newfoundland. MA, MUN. 2003 A Groswater Palaeoeskimo feature from Coachman’s Cove, Newfoundland. Études/Inuit/Studies, 27(1-2),435-449. 1972 Environmental Archaeology and Cultural Systems in Hamilton Inlet, Labrador. Smithsonian Contributions to Anthropology, 16, Washington. 1997 A New Perspective on Groswater Palaeoeskimo Unnotched Endblades. Hons., MUN. 1986 The Postville Pentecostal Groswater Site, Kaipokok Bay, Labrador. Palaeo-Eskimo Cultures in Newfoundland, Labrador and Ungava. Reports in Archaeology No. 1, Memorial University of Newfoundland, pp 65-94. 1997 Archaeological Excavations at Parke’s Beach, Bay of Islands, 1996: Groswater and Dorset Palaeoeskimo and Beothuk Components. 2003 A review of Palaeoeskimo dwelling structures in Newfoundland and Labrador. Études/Inuit/Studies, 27(1-2):375-416. 1989 Native occupations at L’Anse aux Meadows. DRAFT.